Rent: Live is a television special that was broadcast by Fox on January 27, 2019. 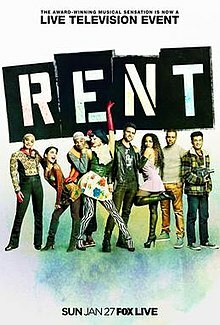 It is a partially live[a] production of the 1996 Tony Award-winning musical Rent, which tells the story of a group of impoverished young artists struggling to survive and create a life in Lower Manhattan's East Village in the thriving days of Bohemian Alphabet City, under the shadow of HIV/AIDS. The original Broadway cast, including Daphne Rubin-Vega, Anthony Rapp, Fredi Walker, Adam Pascal, Jesse L. Martin, Taye Diggs, Wilson Jermaine Heredia, and Idina Menzel made cameos in the special. Several of the songs, notably the various "Voice Mails," "Christmas Bells" and "Finale A", were shortened to fit the run time. "Seasons of Love B" was cut entirely. Marc Platt, Adam Siegel, Julie and Al Larson (Jonathan's sister and father, respectively), Vince Totino, Scott Hemming, and Marla Levine are credited as executive producers. On January 26, 2019, during the Saturday dress rehearsal, Brennin Hunt, who plays Roger, broke his foot. Fox announced in an official statement that despite his injury, the show would air as planned using both pre-recorded footage from a previous dress rehearsal and live footage. On January 27, the show was performed in its entirety with limited physical activity before a studio audience as scheduled, with Hunt performing in a wheelchair. The simultaneous telecast consisted almost entirely of the prerecorded dress rehearsal from the prior night; only the final 15 minutes of the program, which consisted of the songs "Finale", "Your Eyes", and "Finale B", as well as an encore performance of "Seasons of Love" featuring the original 1996 Broadway cast, was broadcast live. The choreography of the final act was modified to accommodate Hunt being in a wheelchair. A technical fault at the start of the show occurred with New York City's Fox flagship station WNYW and its direct fiber connection to cable providers Optimum and Spectrum, resulting in those viewers missing the first five minutes of the special, including all or part the numbers "Tune Up #1," "Voice Mail #1," "Tune Up #2" and "Rent". The special received mixed to negative reviews from critics. On Rotten Tomatoes, it holds a 29% approval rating from 21 reviews, with an average score of 6.3/10. On Metacritic, which calculates a weighted average of review scores, the special holds a score of 49 out of 100 based on 12 reviews, indicating a "mixed or average" reception. Much of the criticism focused on the production's failure to hire understudies for the main cast in reference to Hunt's injury, as well as the decision to broadcast a prerecorded performance for a program marketed as live television. Daniel Fienberg, writing for The Hollywood Reporter, wrote that the network "could have quickly strategized a live concert setting with a limited staging around Hunt and then aired the dress rehearsal at some point during the week." Aisha Harris, reviewing for The New York Times, echoed these sentiments, writing "How do you measure three hours of chaotic visuals and middling audio most of us were never meant to see and hear? ", and calling the camerawork "overwrought." Extensive edits to profanity and sexual references in the musical's lyrical content, made in order to meet network broadcasting standards, was also the subject of criticism, with Variety critic Caroline Framke questioning if a broadcast network was an appropriate outlet for a production of the show in the first place. However, the cast's performances (particularly Fisher, Dixon, Tinashe and Hudgens) were generally praised, and the production design of the program was also well received. In a mostly positive review for The A.V. Club, Caroline Siede wrote that the special "did what these live musicals are supposed to do—reimagine a beloved musical with a new aesthetic, new performers, and new staging choices," and praised the show's finale featuring the 1996 Broadway cast. The telecast received a 1.4 rating among adults 18 to 49 and 3.42 million total viewers, making it the lowest-rated live musical broadcast as of its airdate. In markets where ratings were available segment-by-segment, viewership fell dramatically after the opening segment. ^ Much of the special featured footage from a prerecorded dress rehearsal, as actor Brennin Hunt was injured on January 26, 2019, and was unable to perform the show's choreography. ^ a b c d e f g h Turchiano, Danielle (29 October 2018). "Tinashe, Kiersey Clemons Among Cast for Fox's Live Version of 'Rent'". Variety. ^ a b Turchiano, Danielle (January 27, 2019). "'Rent' Star Injured in Live Performance, Original Broadway Cast to Appear". Variety. Retrieved January 27, 2019. ^ Goldberg, Lesley (January 27, 2019). "How 'Rent' Handled Its Star's Broken Foot". The Hollywood Reporter. Retrieved January 27, 2019. ^ Van Arendonk, Kathryn (January 28, 2019). "Here's Footage From The Actually Live Version of Rent That Fox Didn't Air". Vulture. Retrieved January 28, 2019. ^ Denninger, Lindsay. "Fox Was Down During 'Rent: Live' & Fans Were As Unhappy As Benny During Maureen's Protest". Bustle. Retrieved 2019-01-28. ^ Perrone, Kristen. "Fans Are Losing It Over FOX's Stream Cutting Out Right Before 'Rent: Live'". Elite Daily. Retrieved 2019-01-28. ^ "Rent Live (2019)". Rotten Tomatoes. Fandango. Retrieved February 2, 2019. ^ "Rent (2019) Reviews". Metacritic. CBS Interactive. Retrieved January 29, 2019. ^ a b Fienberg, Daniel (January 28, 2019). "Fox's 'Rent': TV Review". The Hollywood Reporter. Retrieved January 28, 2019. ^ Harris, Aisha (January 28, 2019). "'Rent Live' Review: How Do You Measure a Show You Were Never Meant to See?". The New York Times. Retrieved January 28, 2019. ^ Framke, Caroline (January 28, 2019). "TV Review: 'Rent'". Variety. Retrieved January 28, 2019. ^ "'Rent: Live! ': Tinashe Delivers Sultry 'Out Tonight' Performance". Entertainment Tonight. CBS Studios Inc. Retrieved January 29, 2019. ^ Siede, Caroline (January 28, 2019). "A not-quite-live Rent is a lovingly imperfect celebration of a lovingly imperfect musical". The A.V. Club. Retrieved January 28, 2019. ^ Pergament, Alan (February 1, 2019). WGRZ is storm coverage ratings leader; Pro Bowl rating tops NHL All-Star game in Buffalo. The Buffalo News. Retrieved February 1, 2019. " Viewers knew something was up when Fox announced it was prerecorded before the program began. The rating plummeted (...) after the first 15 minutes of the program." This page was last edited on 22 March 2019, at 19:40 (UTC).